Unique Estates was established as a specialized consulting company for the sale and rental of properties in two directions - luxury and executive. It works with clients and property in the luxury and corporate segment and serves many diplomats and foreign nationals. For ten years it has been a leader and undisputed authority in the market. The company is part of AG Capital - a holding specialized in construction and real estate investments. The portfolio of properties is very precisely selected and carefully divided into selections that represent different property types. You can choose between unique and prestigious urban and rural estates, magnificent mansions, vacation properties according to your lifestyle and iconic properties in Old Sofia. specialized in the marketing and sale of luxury properties we can offer you excellent properties in Bulgaria and abroad, personal attention, high quality services that meet international standards, loyalty and honesty. We have invested a lot of effort to show that in our country there is a market for luxury properties. We are constantly working with customers around the world and we know that Unique Estates is on the level of companies in New York, London or Paris. Our professionally trained consultants are available 7 days a week. As experienced brokers they will assist you to buy or sell your property as quickly as possible under the best conditions. We provide comprehensive consulting support, combined with sensitivity and intelligence. Our services and our commitments to you are grounded on the company philosophy based on trust, integrity, discretion and excellence. Welcome to our home – an aristocratic house on 17, "Patriarch Evtimiy" Boulevard at a time convenient for you. We will be glad to be your friends and partners. Luxury Portfolio International® is the luxury face of Leading Real Estate Companies of the World® the largest global network of premier locally branded companies dominated by many of the world's most powerful independent luxury brokerages. The award-winning website was launched in 2005 and in its first year featured more $1 million-plus residences than other luxury real estate organizations. The network continues to grow and marketed over 50,000 of the world's most remarkable homes last year and attracted over 3 million high-net-worth visitors by presenting a gallery of the finest luxury properties and brokerages worldwide. The brand is recognized throughout the world as the luxury standard of excellence. In addition, Luxury Portfolio International® is unmatched in the global arena, with properties in almost all U.S. states, over 55 countries, website visitors from over 200 countries/territories every month, site translation in nine languages, conversion to multiple currencies and a total inventory of available properties totalling over $54 billion with an average price over $2.6 million dollars. This is a company with limited liability, managed by Dr. Hristo Iliev (Chairman of the Board of Directors of AG Capital) and Vesela Ilieva (Managing Partner). The company Unique Estates was established 10 years ago by two partners – Vessela and Hristo Iliev. It is the first in the market for luxury properties and carries the idea of ​​its founders to be competitive with the best that is happening in the international market. In the company's strategy was reflected the ambition high-end customers to be perfectly served. The contract signed with Christie's International Real Estates is a very big step and success not only for the company but also for Bulgaria as a whole. A lot of effort has been invested to show that in our country there is a market for luxury properties. Unique Estates not only looks serious and authoritative from the outset, but it differs from the mainstream understanding of an agency. Behind the brand stand constant work and improvement of the quality of services, marketing, HR, IT systems, motivation, in the presentation of the portfolio of properties. The difference between the manner of operation ten years ago and now is huge. It's never just a house or apartment. It is always more than location, more than a street or view. When it comes to your home, this is where you return, your piece of the world. Where life flows, as you have dreamed. Home is the mirror of personality and your family, of your pure human aspirations. Be absolutely sure that we will make every effort to understand your dreams and unique nature. Then we will use this knowledge to find the house that describes you, fits your character, lifestyle and ideas of comfort, harmony and warmth. Our values ​​determine the principles of our team of our behavior towards our clients and partners. They are the essence of what we are and what we are striving for in our work with clients of Unique Estates. We guarantee compliance with our commitments. We commit ourselves to providing correct information to you in order to build accurate and transparent relationships. We are stable as a team and we know that tomorrow brings changes. With our professionalism and expertise we have the ability to adapt to market changes and to you - our clients, because we are flexible and know the strife for self-improvement. We respect you, we respect the stable team of Unique Estates. We respect the opinion and attitude you have towards our services. We believe in you, you trust us. We take responsibility for our actions and realize the value behind buying or selling a property. We have open and sincere approach to our customers and partners. We share together time, resources, knowledge and experience to provide our customers what they deserve - home, office, because it is not just a building but a safe investment for your future. Our goal is to build long-term relationships with our clients. 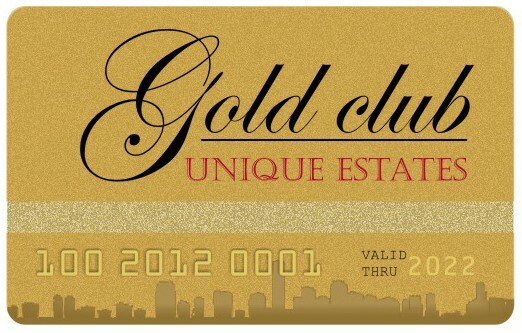 Every club member gets access to all the exclusive events organized by Unique Estates, including the annual Golden Cocktail, which takes place at the end of each year. He is also subscribed to the magazine Unique Estates Life. 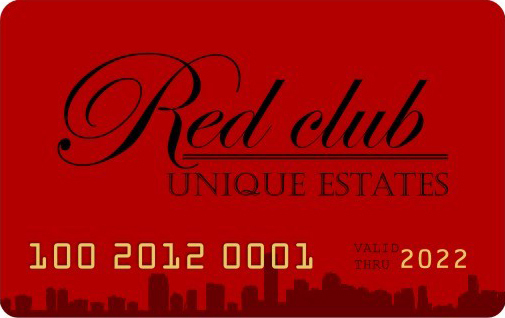 Each member of the club enjoys a special discount for the next deal with Unique Estates. Each club member is subscribed to receive the magazine Unique Estates Life and discount on further deals with Unique Estates. Anyone who recommends the services of Unique Estates to their friends and acquaintances gets a personal recommendation card. It gives him the right to receive part of the remuneration paid to Unique Estates by the respective client in the implemented deal. Unique Estates won the jury award for the best company in the category "Real Estate Agency of the Year", in the second "Year Awards of Imoti.net" for best practices in real estate market. The company won awards also in the categories "Best website of real estate company" and "Agent of the year - rents" in which was awarded Evelina Kostakeva. At the ceremony in Grand Hotel Sofia, eleven agencies and brokers were awarded with statuettes and another 16 received special diplomas. The cause behind which stands Imoti.net with awards is recognition of companies and experts, which in their work uphold the reputation of the industry. The luxury real estate consultancy company Unique Estates won the prestigious Spirit award of the world property network Luxury Portfolio International. The award ceremony took place during the annual international conference of Leading Real Estate Companies of the World in March 2017 at the Fontainebleau Miami Beach Hotel in Florida, USA. The event attracted more than 2,000 of the most successful world experts in the real estate field from more than 25 countries, including five top experts of the Bulgarian company. Unique Estates was awarded in the category "Customer Policy" and "Quality of Service" awards of Forbes Bulgaria. For the fourth consecutive year at a ceremony on 12/01/2015 at the Kempinski Hotel Zografski Forbes Bulgaria announced the winners in Business Awards 2014. The competition, which aims to distinguish the best business practices and entrepreneurship, attended by 55 companies. Their applications were reviewed and evaluated by an independent jury of experts, entrepreneurs and managers. Forbes gave awards in eight different categories: "Client Policy", "Business Development", "Quality of Service", "quality products", "Employee of the Year", "Human Resources Development", "Best start-up business "and" Award for community service. " In each category were awarded companies with the highest scores of the jury. Vesela Ilieva, a Managing Partner at Unique Estates, was awarded in the "Business" category in the charts of one of the biggest Bulgarian-English media - Novinite.com. Her award was delivered by the journalist Rosen Boyadzhiev. She thanks for the prize and promised to Novinite Group that this year she will continue working with the media and to deliver interesting information to its readers. And not only about the real estate market in Bulgaria, but also international. "Your readers will know everything about the prices, trends, and countries to invest in. She noticed that this is her first media award to receive. "A personality in the News" for 2016 in "Diplomacy" category became the Austrian ambassador Roland Hauser, and Yordanka Fandakova - Sofia's major, won the award in "Politics" category. Galina Grudova - senior partner and team manager in our company was awarded with the prize of imoti.net for "Real estate broker of the Year" in the sales category. At an official ceremony on 25th of February, .2016, there were awarded the first annual awards of the real estate portal imoti.net. A total of seven companies and brokers were honored for best practices in the real estate sector of jury awards and users of the portal for real estate. The cause behind which stands Imoti.net with awards is recognition of companies and experts in their work uphold the reputation of the industry, despite the aggressive gray market sector. Since June 2007 Unique Estates has been an active member of the American Chamber of Commerce in Bulgaria (www.amcham.bg). As such we participate in all events, organized by the AmCham and the other members, in all discussions and meetings. Unique Estates has been keeping consistent and useful relationship with the other member- companies and is always ready to satisfy their need of a unique residence. The Bulgarian Business Leaders Forum (www.bblf.bg) is the business association in Bulgaria promoting the values of corporate social responsibility (CSR). Till just about 9 years ago, CSR was unknown as a term in Bulgaria. It was in 1998 when 12 multinational companies and NGOs, inspired by the dream of business ethics, created the Bulgarian Business Leaders Forum. Now, 9 years later, the BBLF has over 220 members - both Bulgarian and international companies. The BBLF Business Ethics Standard has been accepted by over 1500 companies, and the Anti-Corruption and Education statements of the Forum have found their right place on the agendas of politicians, businesses and civic society. French-Bulgarian Chamber of Commerce and Industry is a non-profit organization that brings together about 190 French, Bulgarian and international companies. The Chamber represents the French business in Bulgaria and promotes the bilateral relations between the two countries. It supports Bulgarian companies wishing to export to France and organizes regular events in order to develop cooperation both among members and with different partners. National Association of Realtors is founded in 1992. It is organized in 14 regional structures, combining companies from 28 cities around the country and more than 1500 professionals. Association Of The Family Business (www.fbn-bulgaria.org) is a non-profit organisation. The association’s goal is to work for the development and establishment of the family business in Bulgaria, to support the families in their business to understand and cope with challenges on regional and global levels and to support family business success, as well as to encourage them to ensure their business accomplishment. Since September 2011 Unique Estates has been an active member of the German-Bulgarian Industrial Chamber of Commerce (www.bulgarien.ahk.de). DBIHK is part of the world net of German foreign trade chambers. We are an active participant in all the events and take the advantages of this membership. Bulgarian Association for People Management is a non-profit organization that was created to develop the best professional practices in the management and development of human capital, thereby raising the added value for organizations and contributes to the enrichment of the potential and professional expression of the people. The Association works towards the promotion and development of professionals in the field of human resource management, raising the status of the profession and setting high work standards commensurable with global practices and trends in the profession.